Electrical work on your home can be anything, but it’s imperative to only use a professional engineer registered with a trading body. This guarantees their competency and ensures your safety. After all, your home’s electrics can be very dangerous if wrongly connected, so to avoid any accidents or faults you need to get the basics right and choose a reputable electrician. Whether you want a home electrics inspection, need the system rewired or you’re looking to add another socket to your network, an electrician will be able to complete the work quickly and efficiently. Leaving a problem too long could cost you hundreds, or even thousands of pounds extra later down the line, so ensure to have faults looked at as soon as they arise. Regular inspections will also catch hidden errors before they worsen. Every now and then homes need to be rewired to improve the safety and update the lines. Properties should be rewired every 25 years. 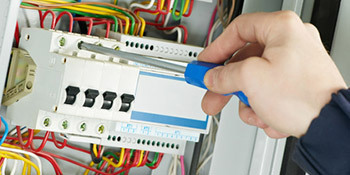 You may also need to rewire your home if the RCD keeps tripping or the fuses blowing. Rubber insulated wiring is also common in much older properties and this should be upgraded too. Often when you move home or change your room around, you’ll need to add a new electrical line or socket to fit your appliances into place. An electrician will run the new line to where you need it, so your plans aren’t hindered. A regular inspection will ensure your system is safe and there’s not a hidden problem waiting to become a fault. Testing your electrics will reduce the chances of you paying out even more money on repairs later down the line and your network will be operating safely. Electrical work can cover a range of scenarios, and qualified electricians will be able to assist you with anything that needs to be done. Any work must be carried out by a competent electrician, registered with a professional body such as the NAPIT, whilst also being Part P qualified. If your home requires electrical work, why not compare prices by completing our quick form and receiving FREE quotes from up to four vetted and reputable electricians in your area. Project: Enquirer: Property Owner General information: Fit new programmer and bathroom light fitting. Project: Enquirer: Property Owner General information: To change 2 light fittings. Disconnect a cooker and wire up a new one. Absolutely excellent from start to end. What a great experience, this gentleman phoned before he came, he text an hour before and he turned up on time - a rare occurence! Found me an excellent installer for my oven! This has been excellent - highly recommend. The below information demonstrates the energy performance of homes in Uk. Energy ratings vary from A to G, with A being the most energy-efficient and G being the least efficient. The Energy Performance Certificate (EPC) rating comes into play heavily when attempting to sell your household, as possible buyers will see what amount they're probably going to be paying for their heating bills. House upgrades such as insulation help to drastically improve a home's EPC rating. There are numerous types of property in the United Kingdom and the information underneath highlights the type of houses within Uk. Throughout the country the most popular housing types are typically semi-detached and terraced housing, however detached homes, flats and bungalows are also available. The pie chart below shows the proportion of houses in Uk that are central heated and non-central heated. Central heating figures within the bulk of UK houses, which includes those on the gas grid and houses heated by oil and electric. The information below illustrates the spread of households warmed by different fuels. Around the United Kingdom the most frequent by far and away are gas heated homes, followed by electricity and then oil. Biomass boilers are also rising in popularity, heated by renewable products such as wood pellets or agricultural waste.|Homes in Britain are heated up by a variety of fuels, such as gas, electricity, oil, solid fuel and LPG boilers. Each fuel has a varying cost associated with it which means you may find yourself with less expensive energy bills by changing the way your property is heated. Even solar thermal panels are being considered by many people as a way to lower heating bills for the many years to come.